A few months ago I picked up a stamping plate with a gradient space - a large etched rectangle that you can paint numerous colours on, and which creates a gradient as you repeatedly scrape over it. This weekend I decided it was time to give it a test drive, and I've got to say I was pleasantly surprised with how it worked out! I started off with a white base (Ceramic Glaze Pure) as I didn't know how well the gradient would stamp on, and then I took my three polishes and layered them on the stamp: Night Owl Lacquer Dragon Blood, Ceramic Glaze Solar Radiance and Color Club Jackie Oh! 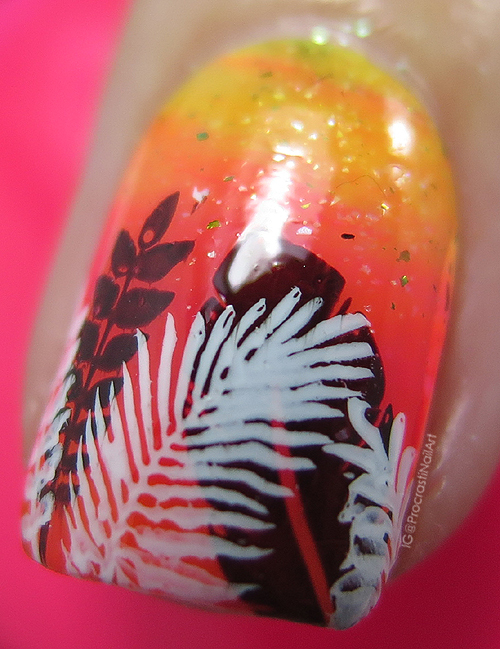 When that was dry I decided to add some stamping, and used images from MoYou London Tropical Collection 23 and MoYou London Pro XL 04. My stamping polishes as always were Ceramic Glaze Little Black Dress and Mundo de Unas White. 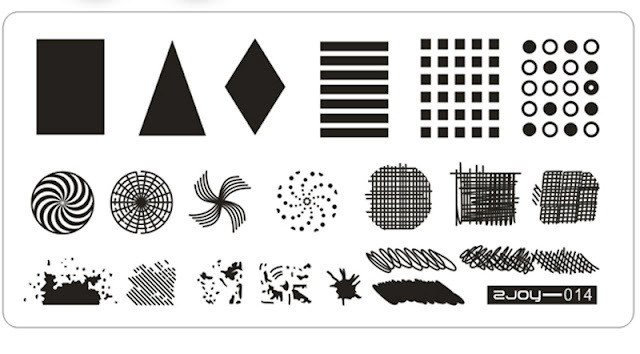 The stamping plate I used with the gradient square was 2Joy-014 from AliExpress - I can't find the listing currently (I didn't pay more than $4 for it) but I've included a shot of the image on the plate from AliExpress below. The Night Owl Lacquer shade had some flakes in it which moved down the nail as I scraped and stamped my gradient, but I think it just adds to the look! 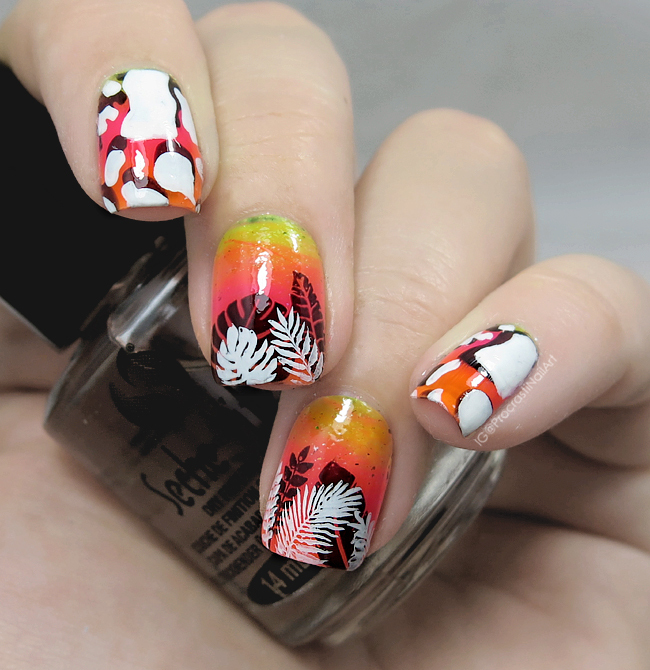 I thought the polish would squish out too much when I stamped the gradient on, but it didn't! I did have to stamp the gradient a few times, so if you want a precise gradient it might be difficult to match it up enough to get the exact patches of colour exactly in the same place each time. Overall I was PLEASANTLY surprised by how easy it was to use this to stamp. Was it easier than using a sponge? That I'm not sure of. Clean-up felt like it was a lot easier (and I forgot to use any liquid latex too, oops) but I'm still not 100% sold on it for some reason. I will definitely try it out again though, and maybe it will eventually become my go-to for gradients. Who knows! Have you tried stamping on your graidents before? Or do you stick with the tried-and-true sponge method? Let me know! 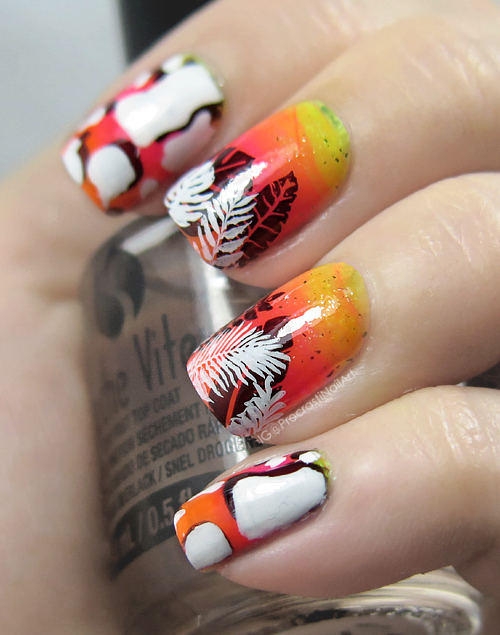 I really like the layered stamping here. 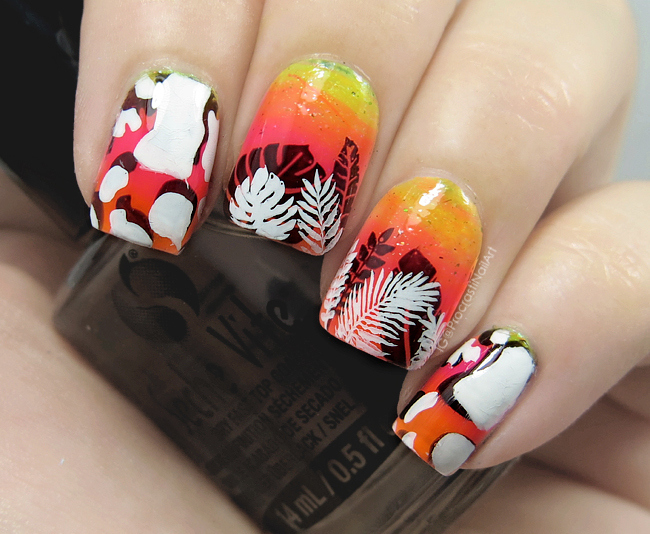 That double stamping is so pretty!